This anecdote is what I heard from my Father. He passed away in 1990. But he was an ardent fan of Mohd.Rafi and he has so many stories to tell about Rafi Saab. I would like to share this one with our Fan Club. It just amazes me reading so much about him and I am not SATISFIED yet, Never will I be satisfied reading about our Rafi Saab. I am pretty sure that there are more and more stories about him. I would like to share one which I heard from my late father. I believe that Naushad saab used to visit Rafiâ€™s house often and during conversations would tell Bashira Begum (Rafi Saabâ€™s wife) that â€˜She was the most LUCKIEST Woman on the Planetâ€™ and when asked whyâ€¦.Naushad saabâ€™s reply was â€˜Aapko tho sub kuch itni Meeti awaz mein milthi hai, Pyar ki baaton bhi and Gusse ki baaton bhiâ€™. Bashira begum was supposed to have replied sayingâ€¦â€™Pyar ki baatein chod dhi jiye, Gusse Ki baatein tho aaj tak nahi mila hamein, Gussa tho unko aatha hi nahin, agar aatha bhiâ€¦woh bus utke chalein jathe hainâ€™. Naushad and Bashira agreed to a plan to make Rafi saab loose his temper time and againâ€¦..but their plan never materialised because Rafi Saab never lost his temper. A child plays tantrums, it never gets angry for, it does not know what anger isâ€¦..Thatâ€™s what our Rafi Saab was. Coming back to the above, finally Naushad and Bashira broke thier plan to Rafi Saab and they had a hearty laugh. Rafi Saab supposedly told Bashiraâ€¦.â€™Agar aapko hamari awaz se Gusse ki Baat sunna hainâ€¦tho aap humse pooch lijiyeâ€¦.Hamein parishan math ki jiye. Aap hamein bataa di jiye kiâ€¦kya kya bolna hain and hum bilkul usi tara bolenge aapkoâ€™. That again is a sheer testimony of the GENTLE NATURE of this Great HUMAN BEING. This entry was posted on Sunday, August 9th, 2009 at 1:06 pm	and is filed under Anecdotes, Meri Awaaz Suno. You can follow any responses to this entry through the RSS 2.0 feed. You can leave a response, or trackback from your own site. yes indeed…I bilieve every words here! Rafi Sab is my heart and he is in my blood circulation.I am very very luccy since I have heard his live songs in Kolkata Indoor Stadium in 1978.My 15 years only son who is learning vocal music is a die-hard Rafi and Sonu Nigam Fan.Since Sonu Nigam sings for Rafisab,my son prefers Sonu Nigam.So this is my achievement that I made my very young son to Rafisab. i am fan of mohd.rafi saab……..i like his all songs in all languages……. he was great singer…….he had gifted voice……..that is why every person get attracted to his voice irrespective of language. Dear Mr. Murali Nagaraj Jee…….Very Nice………….. Waiting for another great story of a great human being as Rafi fans always love to hear about him……. Gentleness obvious from his voice and face. Rafi Sahab as a Music Director ?? It is hard to believe but this is true. The blog writer Mr sagar nahar from hyderabad had wondered for long if such a great playback singer and a great musically inclined human being as rafi sahab had indeed ever composed music himself and the answer to this was found in a gujarati news paper in an article by mr ashok dave who gave this list of four songs where the music was indeed by rafi sahab. But as given above, the full list seems to be larger and Muveen has given the 18 songs where the music was scored by rafi sahab. 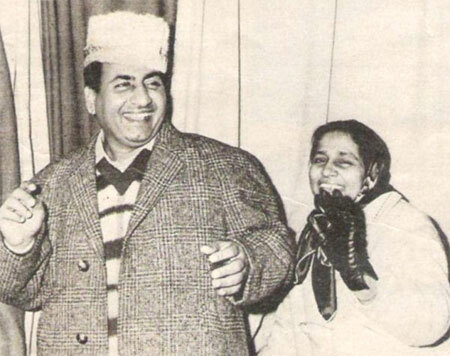 Yes Mohd Rafi was very modest and a very humble person. Rafi saahebs life and work is an open book meant for the syllables of universities and schools. He is an example for many of us in real life . mohd rafi is one of the greatest born indian according to the times of india and lacs of his lovers. i do not understand why some of rafi fans do not want to understand the real rafi saaheb . why they need to go on advertising themselves in the name of rafi. why does people want to print cards proclaiming them to be the voice of mohd rafi. why they claim that they know 10000 songs by heart – and fumble when asked to sing few lines of a song over a national channel. why they wish to take centre stage and bore people to death by their singing in the name of our grand mohd rafi in some of the concerts ???? well : these are some of the answers i am struggling to find as a mohd rafi lover. dear murthy sahib, these are the only 4 songs tuned by the great rafi saab and all these are ghazals penned by the late sardar m.s. bedi. all these are available on a casette of hmv . side a has 2 gazhals and the side b opens with the other 2 ghazala. i would be able to give the cassette number in a few day. the recording quality is also excellent. Can you please translate the Hindi into English? I will be very thankful to you, as I can not read the Hindi manuscript. and the following is excerpt from his blog page. Makes interesting reading. à¤°à¤«à¥€ à¤¸à¤¾à¤¹à¤¬ à¤¸à¤‚à¤—à¥€à¤¤à¤•à¤¾à¤° à¤­à¥€ à¤¥à¥‡? à¤¤à¥‹ à¤ªà¤¸à¥à¤¤à¥à¤¤ à¤¹à¥ˆ à¤®à¥à¤¹à¤®à¥à¤®à¤¦ à¤°à¤«à¥€ à¤¸à¤¾à¤¹à¤¬ à¤¦à¥à¤µà¤¾à¤°à¤¾ à¤¸à¤‚à¤—à¥€à¤¤à¤¬à¤¦à¥à¤§ à¤—à¥ˆà¤° à¤«à¤¿à¤²à¥à¤®à¥€ à¤—à¥€à¤¤ à¤‰à¤ à¤¾ à¤¸à¥à¤°à¤¾à¤¹à¥€ à¤¯à¥‡ à¤¶à¥€à¤¶….. Thanks for this super story first . Yes it is truth that Rafi Sahab never lost his temper in his lifetime . He always smile . I have a big collection of his photos & in every photo he looks very nice with smily face . I am thankful to you for sharing this fantastic story with us . Yes , Rafi Saheb : The Gentlest of Souls . May I expect some more stories from you about Rafi Sahab ? He has the gentlest of souls. Many many thanks for sharing the super story. Can we expect some more stories you have heard from your late father? Rafi saab wife’s name was Mr. Bilquis Rafi, not Bashira. great write-up about a great human being as wel as a great singer all time. lot of thanks for sharing a great storyline about our beloved Mohd. Rafi Sahab. keep it up…………………………. « Rafi sings for himself!